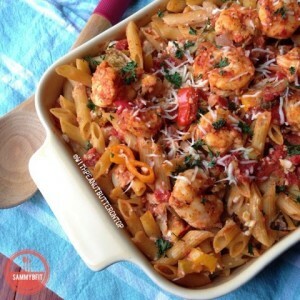 Shrimp and Feta Penne Pasta – the perfect meal if you’re looking for a comfort dish for dinner tonight! The shrimp, feta cheese, and penne pasta come together with some intense and delicious flavor thanks to the herb-infused tomato sauce. I know what you’re thinking; shrimp and feta … with pasta? Who mixes shrimp with cheese?? Seems like a strange combination. But it can’t be too strange if you found your way to this page. If you make this, use a block of fresh feta cheese and not the pre-crumbled. Pre-crumbled will work, but fresh cheese makes all the difference in the world. I promise you! It is the perfect pasta dish for anyone looking for a little comfort during the cold winter months, or if you’re just a pasta lover – like me. If you’re not much of a shrimp fan, you can swap for chicken or the meat of your preference. Or you can go meatless as this dish has enough flavor to stand on its own. Be sure to use medium to large-sized shrimp. Not the little shrimp. Nothing farm-raised. Please… Wild caught is the way to go! As stated above, use a fresh block of feta cheese if you can find it rather than the pre-crumbled. Both will work, but the fresh feta has a better flavor. Place a medium, deep pot over medium heat and add the 1 tablespoon of olive oil. Once heated, add the minced garlic, chopped onion, Brussels sprouts, and chopped bell peppers. Allow them to cook until they have softened. Once they have softened, add the canned tomatoes, remaining seasonings & pesto sauce. Mix well, cover and bring to a boil. Once the sauce is boiling, add the shrimp, stir, and lower to a simmer for 15-20 minutes. While the sauce is simmering, set the oven to broil on low and place a large pot of water over high heat and bring to a boil. Cook the penne pasta according to the directions on the box. Once cooked, combine the pasta with the sauce and mix well. Scoop the pasta mixture into a large prepared baking dish. Fold in the feta cheese, sprinkle with the chopped parsley and parmesan cheese. Place the dish into the oven under the broiler until the cheese has melted. Approximately 2-3 minutes. Keep a close eye on the dish to prevent from burning the pasta. Enjoy!